Remember last summer when it seemed like the air would never clear up? This summer, be prepared if smoke from wildfires affects your community. Wildfire smoke is made up of gases and particulate matter that can be dangerous when inhaled. Carbon monoxide is risky to people who live and work near smoldering areas. Recent warm and dry weather melted last winter's snowpack faster than normal. Even though we had a healthy amount of snow, rapid melting means there is less water to supply our rivers and streams. Below normal streamflows are expected this summer and wildfire risk is high. Where you live determines who calls burn bans. When wildfire danger is high, the Department of Natural Resources will declare a fire-safety burn ban on state lands. Local fire districts will restrict burning in city limits and unincorporated areas, while the U.S. Environmental Protection Agency will call burn bans on tribal lands. If you see someone burning illegally, or if you are being impacted by smoke, report it! Check the Washington Air Quality Advisory (WAQA) and Washington Smoke Information web pages to stay informed about air quality and smoke events. The WAQA uses color-coded categories to show when air quality is good, moderate, or unhealthy. In the event your community is affected by a wildfire, have an emergency plan ready, watch for alerts, and follow evacuation orders. Irregular heartbeat, chest pain, or fatigue. Nonfatal and fatal heart attacks. Symptoms may be worse for people with pre-existing health conditions. If you are in one of the groups below seek medical attention if your condition worsens. People with lung diseases and respiratory infections. People with existing heart or circulatory problems. Infants and children under 18. Don’t smoke cigarettes, use candles, wood stoves, or vacuums, and don’t burn incense. Keep windows and doors closed. Blow a fan directly on you to keep cool. Use a high efficiency particulate air (HEPA) filter to reduce indoor air pollution. Set your air conditioner to recirculate. If you are in a sensitive group, reconsider any outdoor activities. 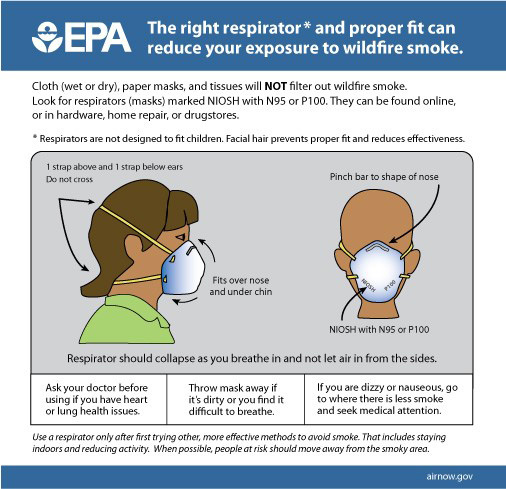 If you must be outdoors, use an N95 respirator mask. These masks filter 95 percent of smoke particles, but they do not protect from toxic gases. Wet towels and bandanas do not provide protection from particulate matter. Respirator masks can’t protect if they don’t fit, so children and men with beards may not benefit from a mask. If you are in a sensitive group, check with your doctor before using a mask. Protect your eyes by wearing goggles. Don’t mow your yard, fill up your gas tank, or do any strenuous activity until the air is clear. Keep car windows rolled up and set your AC to recirculate. When possible, leave the area. Reduce their time spent in smoky areas. Provide them with plenty of water. Limit activities that will increase their breathing. If your pet or livestock is coughing or having difficulty breathing, contact your veterinarian. Using artificial tear drops for itchy eyes. Drinking plenty of water and running a humidifier for a scratchy throat. Taking an over-the-counter pain reliever for headaches. There are many ways you can help prevent wildfires. Seventy-five percent of wildfires are caused by humans. Don't burn yard waste on windy days. Don't throw cigarette butts out your window. Keep the perimeter around your property clear.